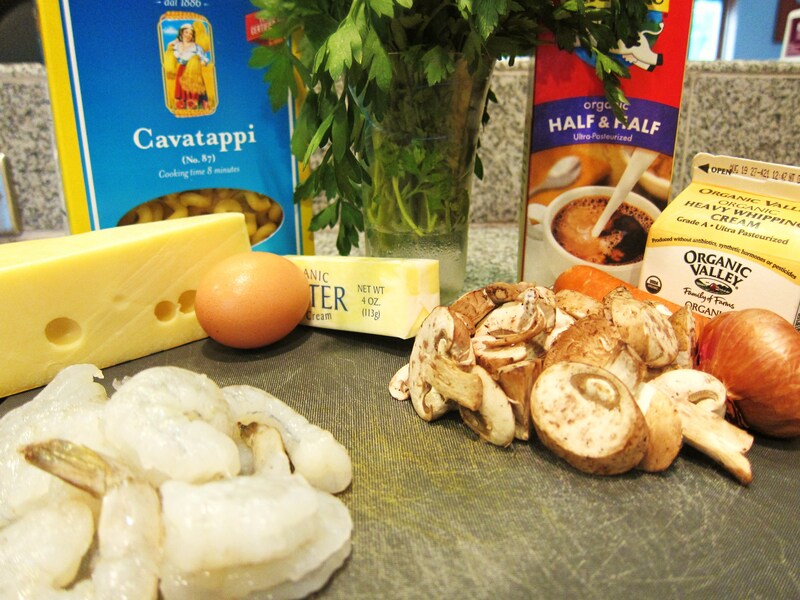 Hubert Keller’s Creamy Mac and Cheese with Prawns, Mushrooms and Herbs – Top Chef Masters Night | Eat.Drink.Life.Love. K and I had just started dating when Top Chef Masters debuted. We decided to cook along with the show, fell in love and the rest is history. So to say we’re excited about the newest season of Top Chef Masters is kind of an understatement. It’s been on my calendar since the premiere date was announced (months, people…we’re talking months here). So to celebrate the new season, we went back to the beginning — the very first Top Chef Masters recipe we ever made: Chef Hubert Keller’s creamy mac and cheese with prawns, mushrooms and herbs (original recipe here). We didn’t know this would become a “thing” for us so we didn’t have the wherewithal to document our cooking journey then, but we did this time so we could share how we made Hubert Keller’s mac and cheese home cook-friendly. Cook up your pasta to al dente (slightly firm, but cooked through) in a pot of boiling, salted water. Prep your food: Dice the carrots and onion (or shallot). Cut the mushrooms. Chop parsley. De-vein the shrimp and cut up into large dice. In a large pot, add butter, carrot and onion (or shallot) and sweat/soften over medium heat for about five minutes. Add in half of heavy cream, salt and pepper and simmer until thickens (about 10 minutes). 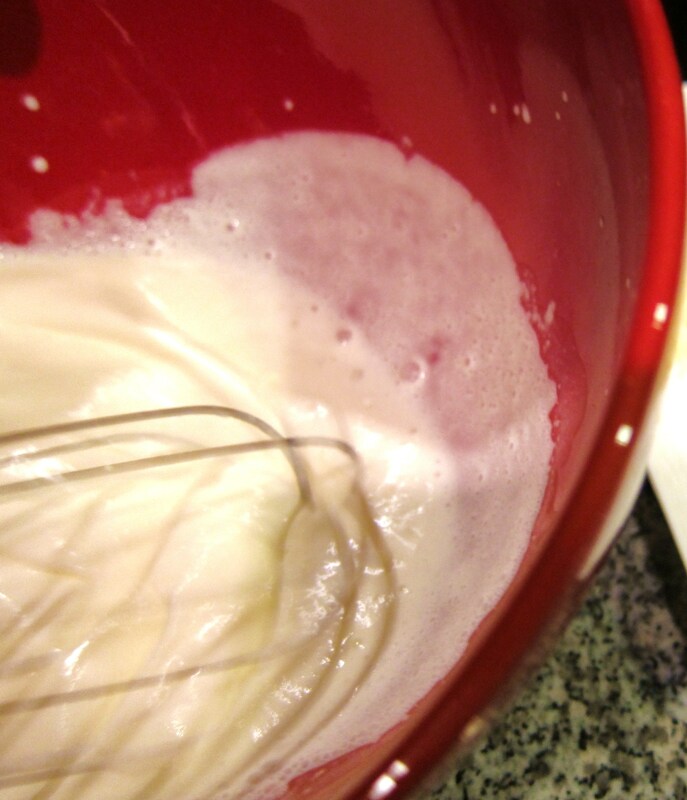 While mixture is simmering lightly whip other half of cream until just thickened (do not form peaks). Do this by hand, not with a mixer. To the simmering mixture, add the mushrooms and Swiss cheese, simmer on low heat for five minutes. Saute the cut up shrimp in a bit of extra virgin olive oil and add the smoked paprika to the oil. When your pasta is finished cooking, drain it and add the shrimp and mushroom/cream/carrot mixture. Gently add the crab (if using — be sure to drain if using canned crab). Mix an egg yolk into the whipped cream then fold into the pasta. Garnish with parsley, season with salt and pepper and serve. WOW, this dish is rich. But it’s also one of the tastiest, most decadent versions of mac and cheese you’ll ever have. There is a slight smokiness from the paprika shrimp and, while the crab didn’t add much in terms of taste, it did thicken the sauce. 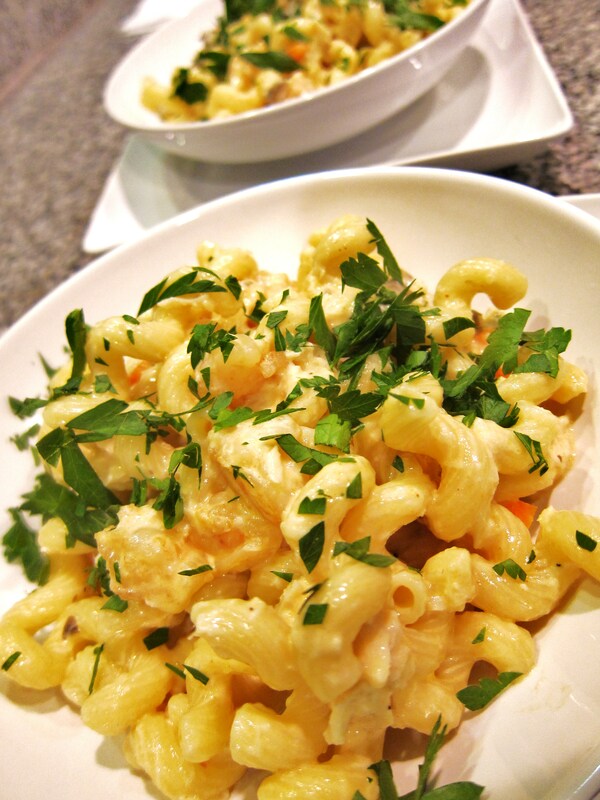 The gentle, creamy cheese got inside the cavatappi noodles for a ooey, gooey surprise and the fresh parsley helped cut through the hedonistic flavors of sweet cream and cheese. Would we make this again? Of course! If we’re feeling calorie deficient and need a once-a-year treat, this is the mac and cheese for us. Soundtrack: A special mix by K featuring some of my *favorite* tunes!